Robin Hill Guest House Guest AccommodationRobin Hill is a gorgeous private house built in 1896 with unique architectural features and large public rooms. Elevated above the road, it commands quite an impressive view of the surrounding area toward the Bay. From the large warmly decorated reception room through the cozy lounge and bar to the elegant spacious breakfast room, you will be delighted by the relaxing and calm nature of your surroundings. 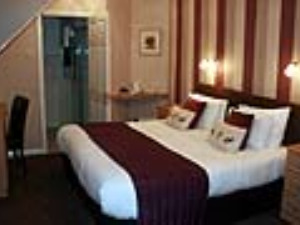 Robin Hill offers bright en-suite bedrooms with complimentary guest toiletries and flat screen TV. A delicious cooked or continental breakfast is free of charge and served at a respectable 08.30 to 09.30. We can also accommodate special dietary needs. We have a private car park and free WIFI access in the public rooms. 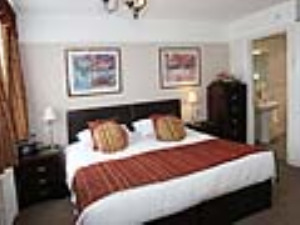 We offer double and 3 or 4 person family bedrooms and south facing terrace gardens. Quietly situated on a side road close to all attractions, ferry boats to Brixham and Dartmouth and many good restaurants, whether you are coming to see a show at the Princess Theatre or treating yourself to a shopping trip, Torquay and the surrounding area are a beautiful place to both live and work, and we know that you will love the area as much as we do, even after only a short visit. We may be able to accommodate a well-behaved sociable dog in some of our bedrooms (by arrangement). 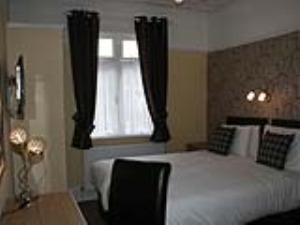 Dogs allowed only in certain rooms please check availability before booking Children welcome from any age. Braddons Hill Road East is just off the A379 Babbacombe Road. When entering Torquay from Newton Abbot direction (A 380) please turn left at the seafront to Babbacombe and St. Mary Church. Please drive past the Hi Flyer balloon and Princess Theatre. Take the first left at the Pavilion roundabout. Take the first left at the clock tower roundabout into Torwood Street. Pass Museum Road on your left, and pass Torquay Museum - Braddons Hill Road East is the very next road on your left. We are no. 74 and we are the 2nd driveway on your right hand side. Less than a 5 min drive from Torquay bus or train station by taxi. No. 11 and No. 32 bus routes along the Babbacombe Road and from The Strand, Torquay. From The Strand buses can be taken to Plymouth, Newton Abbot, Exeter etc? This is a 120year building on th eside of a hill in a conservation area it is NOT wheelchair equipped.